DEBORAH CROMBIE: I was a whole wheat bread-baking hippie mom back in the eighties. I lived with well-thumbed copies of Laurel's Kitchen and Laurel's Kitchen Bread Book. For a few years I kneaded by hand, and I made pretty good bread. Then I got a bread machine, and those loaves were pretty good, too. 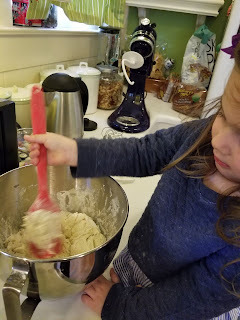 But, eventually, we got busier (I started writing novels, for one thing), the daughter was not so impressed with Mom's home baking, the bread machine wore out. For years my baking genie lay dormant. We ate store-bought whole wheat sandwich bread, and I only dreamed of French baguettes. But in the last couple of years, I've become obsessed with sourdough bread. The bread in my hippie baking days was made with processed baker's yeast, you know, the rapid-rise little packets, a modern industrial invention. 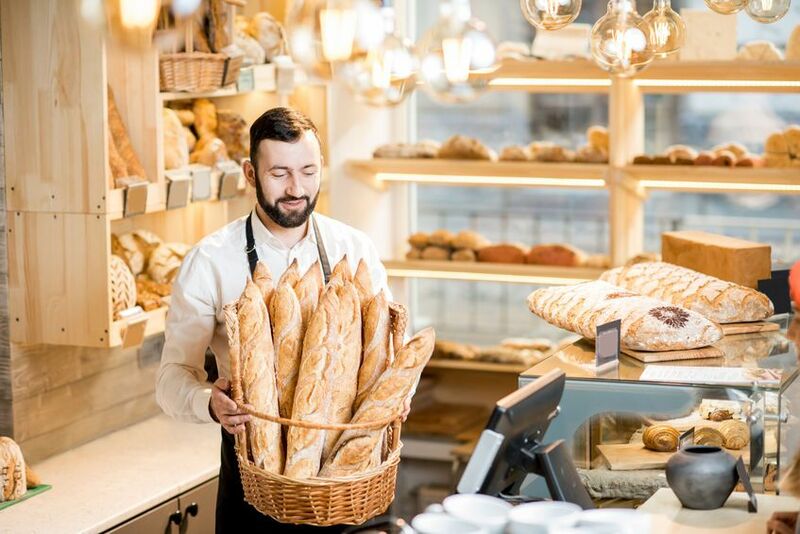 Sourdough bread, on the other hand, is made with wild yeast that grows naturally in a mixture of flour and water, and is as old as human civilization. Anyone who's ever eaten a traditionally made baguette or a loaf of real San Francisco sourdough can tell you there's a world of difference. It's also a lot better for you. I was determined to make my own sourdough bread, and whole wheat if possible. I ordered a dried culture. 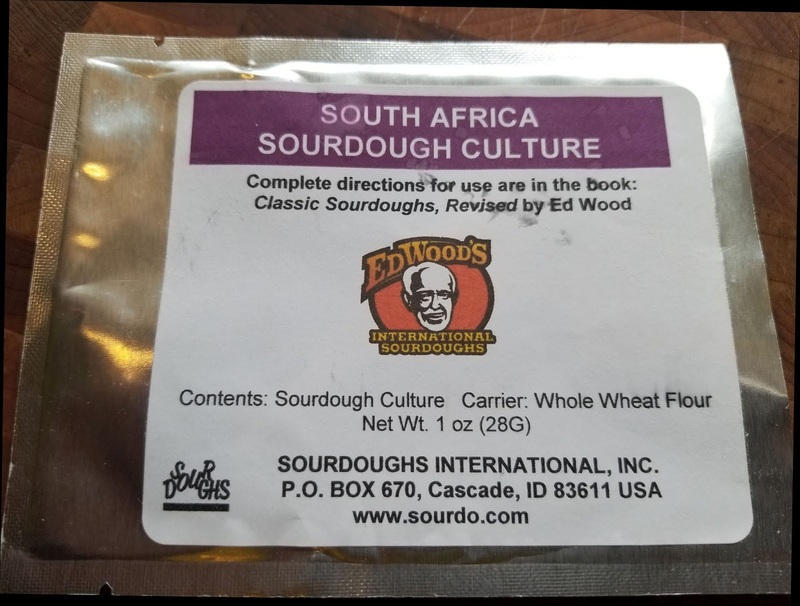 This one from South Africa is supposed to be especially good for whole wheat, but you can get cultures from all over the world, and they are all a little different. I mixed up the dried culture with flour and water and put it in the oven to proof. But I soon learned that my oven proofs too warm. The starter went wild, foamed over the top of the jars, then collapsed! It had, basically, eaten itself. And I can tell you, it smelled terrible!! Think a mixture of acetone and dirty gym socks!! Help! Back to the sourdough bread book and YouTube. Never fear, I learned. A good sourdough culture is hard to kill. This one could be revived! After five days of twice a day dividing and feeding more flour and water, the sourdough starter finally looked and smelled (heavenly) just like I thought it should. It was time to bake! Here's my little helper (granddaughter Wren) starting the dough. Then it went into the mixer for kneading (not doing this by hand anymore!) then an overnight rise. I'm sorry to say there is no photo of the baked loaf because WE ATE HALF OF IT as soon as it was cool enough to slice. And oh my gosh it was good. Not perfect--it could have risen more--but it was so amazingly delicious that the loaf barely lasted a day. There is just nothing that compares to the smell and taste of freshly baked sourdough bread bread. I used unbleached organic flour, because that is what was recommended for starting out. So the next challenge is adding some whole wheat to the recipe. But what are you supposed to do with your ever multiplying jars of sourdough starter??? Has anyone else tackled the sourdough adventure? And if you have any fresh-baked bread memories, please share with us! The smell of baking bread always makes me think of my mom’s kitchen. When she baked bread [at least three loaves at a time], we’d always have a slice as soon as it came out of the oven with butter melting into the warm bread . . . .
Like my mom, I bake bread. [I even bake bread for communion at Church.] I’ve had sourdough starter sitting on my counter and the bread was always wonderful, but there were times the starter grew so fast it threatened to overtake the kitchen, kind of like one of those old “B” science fiction movies! 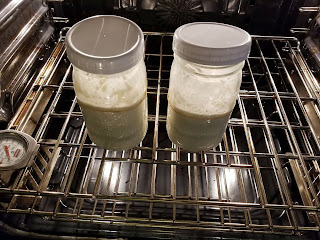 I’ve often baked bread and given loaves away with a mason jar of starter and directions for making the bread and feeding the starter, just to keep ahead of the ever-growing starter. I have a bread machine, but I tend to knead the bread myself. It’s lovely to have the house filled with the smell of baking bread . . . . I think the very best thing you can do with all that starter is bake extra loaves and give them to your critique partner and brainstorming buddy. Just a thought. I did the whole bread machine thing back in the 1990s, and kept at it for several years, until the bread machine wore out and Life decided I needed to direct my attention elsewhere. But somewhere in there I tried the start-from-scratch sourdough starter--the kind where you put it out on the countertop and hope it doesn't turn purple. (Purple is bad. Purple is botulism. On the other hand, purple could be a good way to poison someone . . . ) I kept up with the starter for nearly a year, until I got tired of sourdough bread and started thinking the starter was akin to Audrey II from Little Shop of Horrors. (The musical version, not the Roger Corman original.) I finally let it die because I had other things to do. 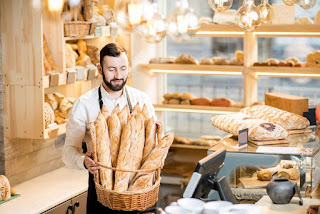 I agree that the smell of freshly baked bread is a little slice of heaven, and Joan's memories of warm bread and melted butter have made me hungry. I. like Joan, have memories of my mother baking bread - 3 loaves at a time. I think she did it at least twice a week until she realized it wasn't saving money (the reason Dad wanted her to bake) and he was eating it too fast, it was making him overweight so she stopped. When I was in junior high my cooking class home project was to make bread. I pulled out that old cookbook from Good Housekeeping and got started. I made mom's exact same bread recipe, all three loaves. I got an A, no one else made bread. I've made bread off and on since then but making bread can be a lot of work for only one person. I don't need that much bread. I've never tackled sourdough. I live in the San Francisco Bay Area with all those good bakeries and that special air that creates that great sourdough yeast. I'll leave the sourdough to The Experts. 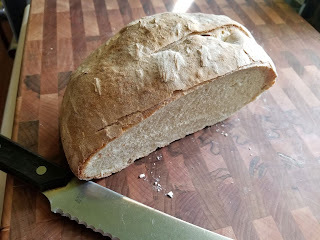 I have one favorite recipe that I have made a few times, cookbook calls it Basque Shepherd bread. I cook it in my cast iron Dutch oven with the lid on to start. It's pretty cool when the bread lifts lid off while it bakes. My niece bakes bread, at her parent's house. Unfortunately she doesn't exactly follow a recipe, likes to improvise. Though the last time I visited, she said she followed the recipe. It said 2 loaf pans. Too much bread, not enough pans, burning dough on oven floor, smoke filled kitchen and family room...... I'll leave it there. Deana, if I lived in the Bay Area and could buy real San Francisco sourdough, I probably wouldn't try to make it either. One of our local supermarkets her in the north Dallas area makes an artisan loaf they call "Monterrey Sourdough" and it is fabulous--but it's also $6 for a small boule. Ack. 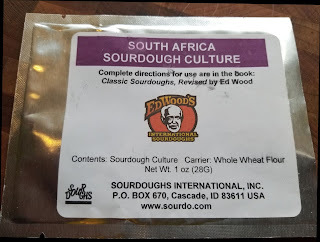 The sourdough site I bought my starter from also has (among many others) a culture for San Francisco sourdough. I may have to try that. And there is always King Arthur Flour for all things bread, sourdough or not. Flora, thank you, thank you! If I'm late posting here it's because you sent me down the Internet rabbit hole! Pancakes! Pizza dough! And CRUMPETS! I'd been so focused on feeding the starter properly that I hadn't really investigated online. Can't wait to try these other ideas! Ah, I can already see the pizza dough thing coming in handy. Too bad, Trader Joe's. Debs has her sights set on something better now! My mom made the best oatmeal molasses bread. She didn't make it all the time, but often -- maybe once a month or so. She gave my siblings and me the recipe at one time, but it was at a time when I was uninterested. As I sit here with my lonely cup of tea, I'm thinking I must get the recipe from her again. It was really good for toast! Oatmeal molasses bread sounds fabulous. If you get her recipe, you'll have to share it with us! We bought a bread machine a few years ago and used it all the time. I was making a loaf a week. Then the shiny wore off and now we mostly use it for pizza dough. I love a good sourdough, but the start intimidates me. Luckily, Edith Maxwell said she'd bring some for me to Malice! I started making bread when I was a teenager and have continued to bake it off and on. One of the best ones was oatmeal bread that did make wonderful toast but I really think all homemade bread makes the best toast. Never tried sourdough though but maybe I will now. I have found that the king Arthur flour website is excellent for answering questions and providing tips. I don't know why it didn't occur to me to check out the King Arthur website. I even have a cookbook by their master baker, who I met at a writer's conference! With the exception of homemade pizza crust, I haven't baked bread since the nineties. My kids were hooked on homemade banana and chocolate chip muffins and I routinely cranked out double batches. Like you, I made whole wheat for decades from the Tassajara Bread Book. Now I haul out my sourdough starter every week or two, but I don't divide in half. I put it all into the sponge and once it had activated, I take out a half a jarful and save that, then I add the rest of the flour. I usually do the sponge with unbleached white and add whole wheat to finish it. 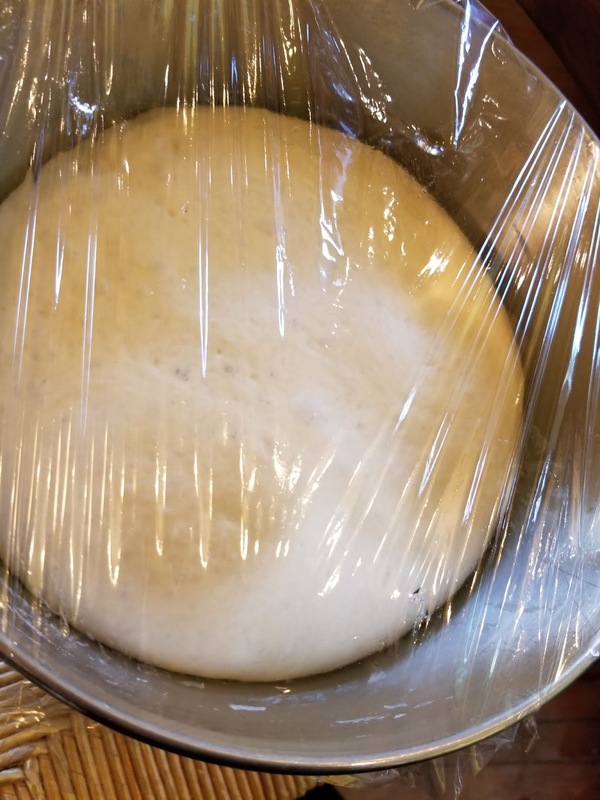 I find a 48-hour process really brings out the sour - sponge overnight in the fridge and dough overnight the next night, baking on the third day. I want to experiment with no-knead, too - I think you get an airier bread that way. Have fun with yours! Edith, is your recipe from the Tassajara Bread Book? Could you share? My yeasted recipe is, but not the sourdough. Yeasted is three cups warm water, 1 tablespoon (or packet) yeast, 2 tablespoons honey. Stir until yeast is dissolved. Add enough ww flour to make a thick mud. Beat 100 times and let rise until doubled. Add more flour until it sits up in a rough ball. Turn out onto floured board. Scrape the bowl well, then oil it. Knead until dough is shiny and doesn't stick to board. Turn smooth side into bowl, then flip so the top is oiled. Cover and let rise until doubled. Punch down all over (about 30 times) and let rise until doubled again. Turn out and form into a ball. Cut into two or three pieces and form into balls. Oil appropriate number of pans. Let sit five minutes. Knead one ball six times, then roll into a tight spring and pinch the seams. Place smooth side down in the pan, then flip and press into pan with back of hand. Repeat for other ball(s). Cover and let rise an hour. Preheat oven to 350. Slit tops on diagonal in two or three places, brush on egg wash, and bake until the loaf sounds hollow, about an hour. That was from memory, I have made it so often! Hallie, I have a no-fail, no-knead bread recipe, if you want it. It takes minutes to mix, four hours to rise, and an hour in the oven. The catch is that you need a Dutch oven capable of withstanding 475 degrees, including the lid. (A lot of handles can't take heat that high.) But it makes a delicious artisanal bread, with only four ingredients: bread flour, water, yeast, and a little bit of salt. That sounds like bread I could handle, Karen. Taking three days to make one loaf? There's no way I could fit that into my work schedule. But five hours on a Saturday or Sunday? That I can do. Please share the recipe! I made bread in my hippie days and now hubs has discovered it. Really, there may be something to the rumor that men make lighter loaves - his are better than mine were. He's currently into Russian Black Bread, but had considered sourdough, one of his favorites until he read the recipe and wondered if the starter took over the kitchen like something from the Blob. I'll have to share Edith's technique. Sounds like there may be hope! Kait, check out Flora's link above. There are some great ideas for using the excess starter. It sounds like we've all gone through a bread baking phase. I am in awe of those of you who carry on the tradition. I have only been successful with one particular type. I worked in a restaurant in the 70's that served a beautiful dark bread which they called "limpa". It was a dark rye, molassesy with a hint of orange, rounded loaf similar to the shape of the sourdough loaf. I used parts of two different recipes to get close (Fannie Farmer Cookbook and the James Beard Book of Bread). The final product was heaven! P.S. In all the moving, I got seperated from my beloved bread recipe. I've just checked the cookbook corner of the shelf and found the bread books have been replaced by Weight Watchers Complete Collection. This just doesn't seem right. I need to fix this! Lyda, that sounds fabulous. Love anything with real molasses, love anything with orange. If your find your recipe, please share! I love bread but cannot bake to save my life. My French DNA does nothing to help with this. Slice and bake cookies--I can mess those up given half a chance. When a wonderful friend sent me a loaf of her homemade sourdough bread, I was both appreciative and admiring. So good! See my reply to Hallie, above. I'll put the recipe in the comments below. It really is a no-fail recipe. That sounds wonderful, Deb. I've never made sour dough, but I do make bread all the time, sans bread machine. Once I began to let my KitchenAid do the kneading, it got a whole lot easier. However, I do knead it a bit myself before putting it to rise. I vary my efforts between the artisan bread in five minutes a day recipe and Julia Child's sandwich bread. When I make whole wheat, I find less is more. But I do put a ton of various seeds on top, sesame, poppy, caraway, whatever I have. Pumpernickel is a favorite here. That is just rye bread with a lot of things in it that make it a rich brown: coffee, molasses, caramel coloring! Yes, when I get a little better at it, I will! I can certainly bake more than one loaf at a time, but not sure I can knead more than one loaf's worth of dough in the Kitchen Aid. What do you think? Yes Deb. I knead 7-8 cups and f flour in mine, which is just like yours. That makes two humongous or for reasonable sized loaves. I am in awe! I am applauding with appreciation. Wow! You are so devoted, and you persevered! Love this! And as you can tell from my accolades, no, I have never… Well, wait. We had a bread maker thing. Guess where it is. Hank, you are so funny. Did you ever use the bread machine? 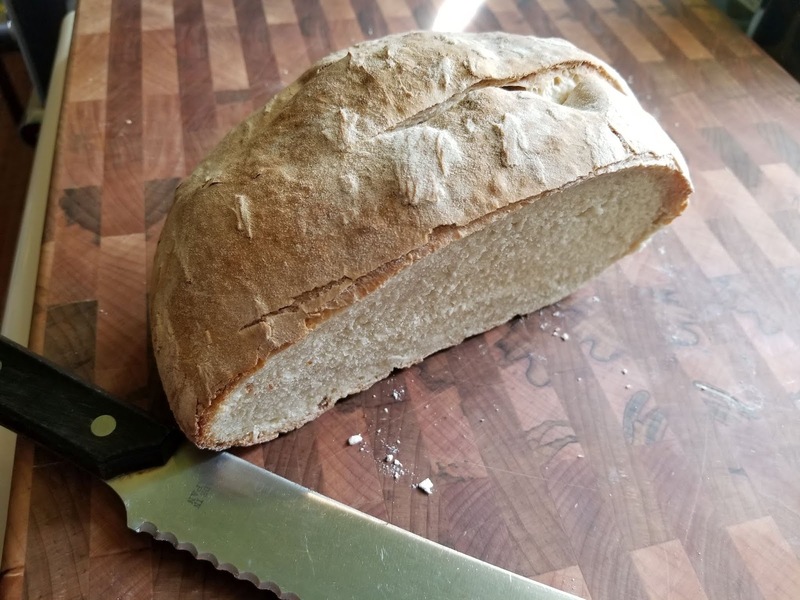 For a while my family kept a friendship bread going -- someone gives you a starter, and for about a week you either stir or add igredients daily, then you bake and it is really delicious -- I just don't remember how to do the starter anymore :( I am so impressed with your sourdough bread story! You give starter to friends. We have some of my son's in the fridge. I haven't had time to try it yet. Let us know how it is, Rhys. I've given my daughter a jar--and that's my backup just in case something goes terribly wrong with mine! My mother worked from the time I was two, so she did not do any kind of baking, except for special occasion treats. However, we stopped at our aunt's house after school, to wait for Mother to pick us up on her way home from work, and my aunt did bake. Even better, every Wednesday our great grandmother, Little Grandma, came over and she and my aunt spent the day baking bread. We could smell the fresh bread a block from the house, and it always made us run the rest of the way there. Little Grandma timed the baking so we could have fresh, hot bread slathered with butter soon after we got there, bless her heart. One of my favorite childhood memories. This recipe is one I use a lot, and it came from Mother Earth News, years ago. 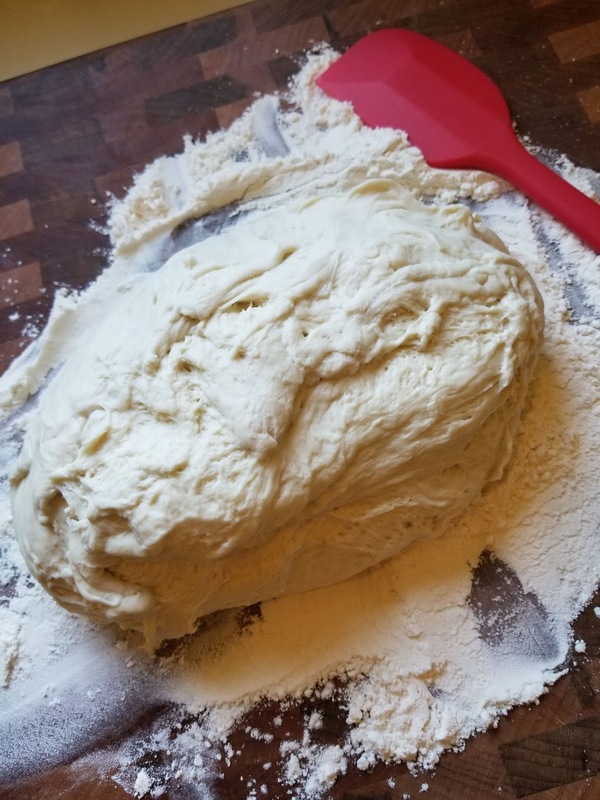 There are other, more complicated versions, some which include rising the dough overnight, etc, but this one is so good, and so easy, I can't see reinventing the wheel. The only catch is that you absolutely must have a Dutch oven that can withstand 475 degrees, and that includes the lid of the oven, because a crucial part of the recipe is to have the lid on for part of the baking time. I have a wonderful KitchenAid cast iron Dutch oven with a silicone handle, and it does the job beautifully. The best parts of this bread: four ingredients. No kneading. Takes six hours, start to finish. No sugar. Absolutely delicious. Looks like a million bucks. From Mother Earth News magazine. Additional comments added by an online friend who ran a restaurant in upstate Washington for many years. 1. Combine flour, yeast and sale in a large bowl. Add warm water and stir till blended.....dough will be shaggy; I used my hand to finish bringing it all together. Oil hands and turn the dough over in the bowl. Cover with plastic wrap and let rest to rise for 4 hours (I put in the oven with the oven light on, that's a perfect temperature) Use a timer if you have an hour timer. You’ll know the dough is ready because there will be bubbles all over the surface. 3. At the same time, put a 6-8 quart heavy covered pot (cast iron, enamel, Pyrex or ceramic) lid and all in the 475° oven as it heats up. Make sure the pot and oven heat for 30 minutes while the dough rests. out as it bakes. Be super careful. The pot and lid will be HOT. Karen, that sounds fabulous. I think Le Creuset would work for this? Oh, and I love your bread memory!! The knobs on Le Creuset are suppose to be heat resistant, but if you need to be extra-sure you can buy metal knobs to replace the black ones. Also, I'm looking at my 5 quart casserole and my 3 quart one, and thinking, "If I halve the recipe . . . " I know I have to try it. It depends on the handle of your Le Creuset. I'd make sure it can withstand the heat first. By the way, I have also used half whole wheat flour in this recipe, and have added garlic cloves, different herbs, and even nuts to the bread. Not all at once, of course. But it's very versatile. What a wonderful memory, Karen, of your aunt and grandmother making bread and you being there for the fresh baked bread. Yum. I have never made bread, but you recipe is tempting me. Yeah, Gigi, I think my Dutch oven is 5 1/2 quart? I wondered about that, too. And next time we get to Sunday brainstorm, I promise I'll make you bread. Or maybe crumpets with our tea! Big fan of sourdough bread. At the airport leaving San Francisco, I always see loaves of sourdough bread for sale near the gates. When I was a kid, I loved homemade zucchini bread even though I did not like to eat zucchini. Now I cannot eat whole wheat bread. Now I can eat sourdough bread or Gluten free bread. Diana, there is a lot of speculation that some people's sensitivity to wheat may have to do with the fact that the grain in modern commercial bread (or even homemade bread make with baker's yeast) is not fermented. The sourdough fermentation process makes the grain more digestible. Deborah, thanks! I learned something new today. Diana, there's also a theory that people don't tolerate the new commercial wheat varieties. Lots of people who are gluten sensitive seem to do fine on artisan bread in Europe, where they use different wheat. Here, you can order heritage flours from several mills. There's one in Austin and one in New Orleans that I know of and I'm sure there are more. I may have to try that when I get a little more experienced. Nancy, I'm sure you could freeze extra rolls. I bake bread once a year, at Easter. I have my Polish grandmother’s babka (Easter bread) recipe and it’s a tradition I have carried on since I was in my early 20s and on my own. It’s eggy, sweet, and buttery. My kids still love it. My one son does not like raisins, so one loaf is sans raisins. It’s almost time to bring out the recipe!! Oh, wow! I love bread and freshly baked bread so much! We have a bread machine that can call the hooligans home more efficiently than I can. It's like they know exactly when the timer goes off and the herbed bread is ready to be slathered in butter and devoured. I've always wanted to try my own sour dough - you're inspiring me, Debs! That loaf looks amazing! I use the 19 hours No Knead Sourdough by Alton Brown and it comes out perfect ever time, no need for any starter. 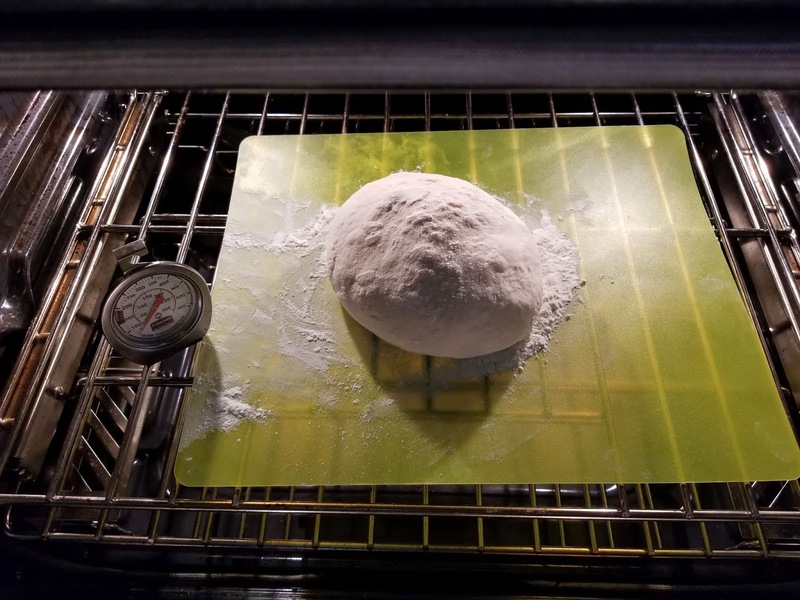 I grind the wheat in an electric mill, and I love using the Kitchen Aid mixer since it kneads bread so well when I use a traditional recipe with yeast. Mom used to make cracked wheat (hand kneaded) bread that was divine, but the recipe was lost somewhere along the line. She also make killer white bread. When we were kids we bought the frozen bread dough and made doughnuts out of it - now those were really delicious! LOL It's a lot easier making home made bread now days and anyone can be successful with all the good recipes out there. Years ago I had a sourdough starter and baked with it frequently, but I abandoned it after two years or so. Now, it's mostly the No Knead bread--I let mine rise overnight. My latest toy is a Pullman loaf pan from the wonderful folks at King Arthur's. It has a lid that slides on, to make a sandwich bread that has perfectly square slices. Very useful for stacking for the dining room on a train. I never caught the breadmaking bug. My Kitchenaid has a virgin dough hook. My f-I-l bought a bread machine way back (the one that looks like R2D2) and played with it quite a few years. My husband was monkey see monkey do, so he got one too. I did use it, and generally liked the results. When my sister died I got her bread machine and used it more until it croaked. As for R2D2 I don't know if we got rid of it or it's still in storage. When we lived in Metairie, LA there was a bakery across the street from the Episcopal church we attended. It was open on Sundays.They would activate a flashing light when they had just taken French bread out of the oven. Dad would stop in and get a loaf and we'd devour at least half of it before we made it home. The crumbs did fly! 13 tears ago I had a stroke, which made my right hand unable. I had to quit my job, a nd most of my hobbies. Having never baked bread, but having time on my hand. It started with a machine, and things progressed to where On Jan. 1, 2015 I bit the bullet and made my own starter, and about a week later, made my first Sourdough starter. Now, 4-1/2 years later, I mill my own flour, and make about 2-4 loaves per week of my own Sourdough Bread, using only, flour, water, salt, and my starter. All with only my left hand and some time. It works, is delicious, and is much cheaper than what is bought at the grocery. It does use some flour and water, which I either make pancakes, waffles etc., of simply say "thank you for helping me make bread', and then I scrape as much as I can into the garbage.It did its part. What an inspirational story! Thanks so much for sharing with us! Do you knead your bread in the machine? No, I don't really knead it anymore, I worked out a way. But instead now, I do a stretch & fold series every 30 minutes for the first 2 or sometimes 2-1/2 hour, then I let it sit for the next 2-1/2 hours, then shape it, put it in a banneton and into the fridge overnight, next morning I bake it in room temperature La Cloche and turn on the oven after I have put it in, bake 30 min. covered at 500 degrees; then I uncover it and turn the oven down to 450 degrees for an additional 20 minutes. I hate to admit that I have never made bread, mostly because I do so love to eat bread. I sometimes have a snack of buttered toast. And, I do appreciate the delicious breads that some restaurants serve. My mother was a wonderful cook, but she didn't bake much. Of course, we had a local bakery that was out-of-this-world delicious, so baking our own wasn't a necessity. However, there is nothing better than fresh bake bread, and I might work up the courage to give Karen's recipe a try. Kathy, now that your hubby is home at least part of the time, you have someone else to share the bread! That's true. I might give it a try. Two words: Sourdough pancakes. Seattle was the jumping off place for the Yukon/Klondike Gold Rush. The miners cuddled their starter, swaddling it like a baby to keep it alive. Amazingly, some of that start is still living in fridges in WA state and in AK. Starters, often called "herman" were given as wedding shower gifts during the late '6o's. That is where I got my starter. "Herman" lived with us as long as we were on the left coast, We killed it (him?) before moving to CT. I still miss those pancakes. I love that history of the Gold Rush sourdough starters. I think part of my fascination with sourdough comes from my biology background. And before I was a biology major, I was a history major, so I've got two threads going there. Your sourdough dilemma reminds me of the Amish cake starter from years ago. You'd make a lovely cake and then have an excess of starter. You packed up a batch with a recipe and give it to a friend. You usually ran out of available friends before running out of starter. I baked my sourdough on our pizza stone, btw, and spritzed the oven a couple times with water in the first fifteen minutes. The theory is that gives you the chewy crust, and it certainly seemed to work. My older sister asked for & received a bread machine for Christmas while in high school. Best gift ever for the rest of the family as we were the perfect guinea pigs while she tried out new recipes. Unfortunately, when she went off to college the bread making stopped. Seems many of us got our sourdough start in the 80s, or some said their "hippie times". That's my story too, but it was late 70s. The Orowheat company had an overstock store nearby and they also carried many kinds of flours. I started just making regular white and wheat loaves, then went to French, and then got some sourdough starter from a friend and that was that. I made sourdough loaves for years, until it was lost during a move. Someone, somewhere may have that jar to this day. I know that my mother baked bread because baking was one of her hobbies, and she tried everything. However, except for holiday family meals, we didn't eat bread with our meals. Bread was for sandwiches and toast. If I try to bake bread, it will be banana, zucchini or some kind of dessert bread. I do buy bread at the farmers' market that is better than the regular store stuff. I have just jumped on the sourdough band wagon! Your story, Deborah, is much like mine. Hippie days baking bread while wearing Birkenstock sandals. I have read and reread and listened to your books so many times. Now you MUST feature someone who bakes sourdough. Maybe on the coast of Cornwall?? ?